I'm shocked to hear Joyce passed away - what a sad loss to the mystery community. That is very sad that she passed away. I love mysteries, so I will have to look into this book. Sending lots of purrs and hugs. So sweet post. So sorry. Life is so unexpected and tragic, we must savor every moment. Please accept our condolences for the loss of your friend, she looks so sweet in the photo. We are so sorry to hear this news. 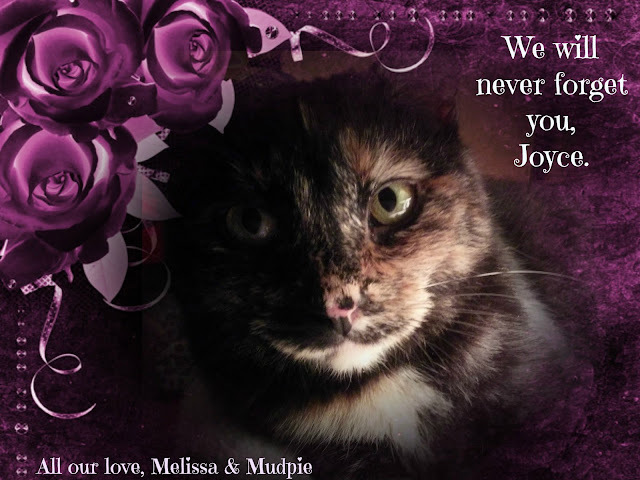 Purrs to Joyce's family and all those missing her so much. That is so sad, I am sorry. We are so sorry for such sad news. That is such a wonderful tribute to Truffles. We were so sorry to hear about Joyce's passing, and are sending purrs and prayers to her family. Who iss looki gorgeeuss inn her foto mee mite add. We are ha[[y Truffles name was chosen to be in the book. 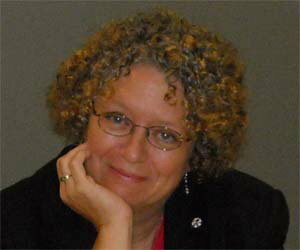 We are very sad, however to learn of the sudden passing of Joyce. We pass along our condolences to you and her family. Sorry to hear of Joyce's passing. Our thoughts are with her friends and family. Oh, I am so sorry about Joyce. What a lovely thing she did naming the tortie in her book after your Truffles. That must be even more special to you now. I'm off next to Good Reads to check out this book. I LOVE cozy mysteries, especially ones with kitties, and I haven't heard of this series. So sorry for the sad news about Joyce. We are very sorry to hear about your friend. We are so sorry about Joyce. We want to thank you for your kind words about our Dorf crossing over. He was so loved here at Forty Paws, and we miss him daily. It's been a rough week indeed. RIP Joyce. You have been, are and always will be an angel. So sorry to hear about your friend's passing. Purrs and Prayers to her family. how unbelievably bittersweet.. My sympathies on the loss of your friend. So sorry about Joyce but congrats on the cover and mention. I'll definitely have to check this series out. Oh, dear, this is so, so sad. My deepest condolences to Joyce's family…. But I am gladdened that you have the book-- a beautiful and lasting tribute to both Joyce and Truffles. No doubt Truffles is sitting on Joyce's lap right now, purring her approval.